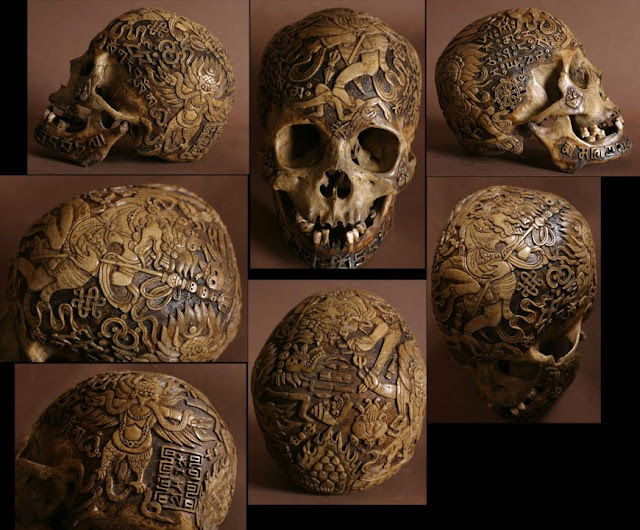 When I was browsing for images of skulls, I came across these examples of intricately carved human skulls. They are apparently quite old and from Asia, and with a Buddhist connection, although I can't be sure. All I can say is that they are incredible in their detail and beauty. The patina of age and the imagery on each one is amazing. I wish I knew more about the graphic symbolism and their actual provenance. Maybe one of my readers can enlighten us. One can assume that these are now hidden away in a personal collection somewhere. I wonder what the ethical ramifications are for possessing something like this. Where were they taken from in the first place? And of course, the eternal question: Who were they? From the imagery and writing on the skulls (amazing!! ), they appear to be Tibetan. They remind me of a Zen Buddhist story of a monk who is traveling. He is exhausted and very thirsty at the end of a long day of walking. It is pitch black out and he finally finds a place to lay down and discovers a cup of water on the ground. He gratefully drinks the water and feels refreshed, as if his luck has changed. In the morning, he wakes up to discover that he has been sleeping in a charnel ground and his cup of water was half a human skull, with bits of flesh still attached. His cup of good luck is suddenly disgusting and makes him throw up. But what really changed? believe it or not, i personally own a skull like that. i bought it in an antiques store in vienna. 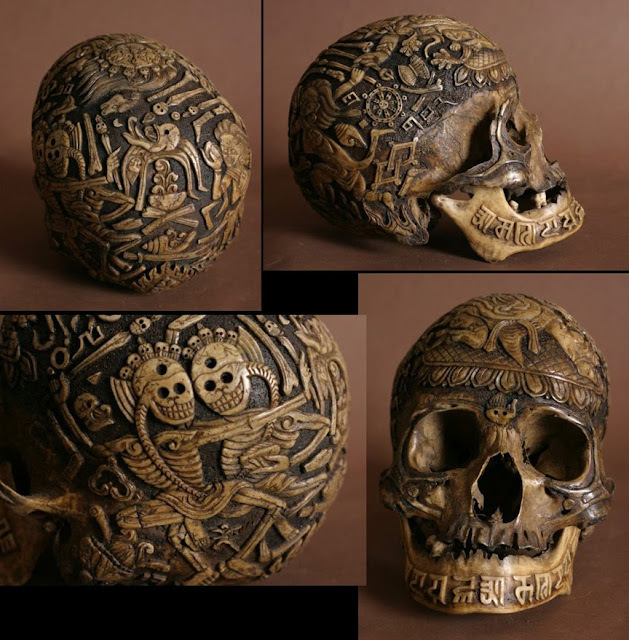 my skull has similar carvings on it, but it looks a lot older than the ones pictured above. i showed it to many experts and museums, but no one ever saw something like that, except one tibetan monk. he said skulls like that where carved to take a curse off of a family or to guide a mislead soul on the right path. in both cases, the skull was then given as a votive offering to the lama of a monestary. in the case of my skull, it's said that a viennese medical doctor traveled tibet a long time ago. he also gave medical treatment to a high lama. the doctor got the skull (amongst other relics) for his services. to us, that may sound like a sin. 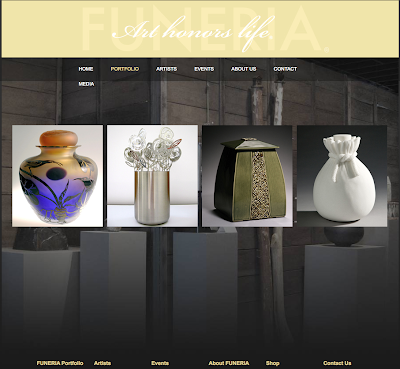 but for the buddhists, the skull served at a votive offering already and it's duty was done. i asked experts and monks, but they all said that no one in tibet would think about reclaiming a skull like that. the legal part: in most western countries it's legal to own body parts which are older than 100 years. think of the remains of saints shown in churches all around europe. many schools and universities own skulls for their art classes and skeletons for anatomical studies. hell, medicine students even take dead bodies apart just to learn about the interior. the chopped up body pieces are burnt or buried in mass graves. you still wanna ask the ethical question? you are welcome. the tibetan monk was the least carefull of all experts when handeling the skull. to buddhists, a bone is just a bone and nothing else. should i bury it? i quit church, so i'm no christian. also the man who the skull belonged to in the first place was no christian. it most likely was a buddhist. buddhists used to have "sky burials". the body was brought to a high platform near a monestary and chopped into pieces (most of the time the widow chopped the body of her dead husband). then the vultures came to take the bodyparts. that's how the buddhists could get as close to heaven as possible. to them it's just a bone, but you can be sure that my skull is in the right hands. 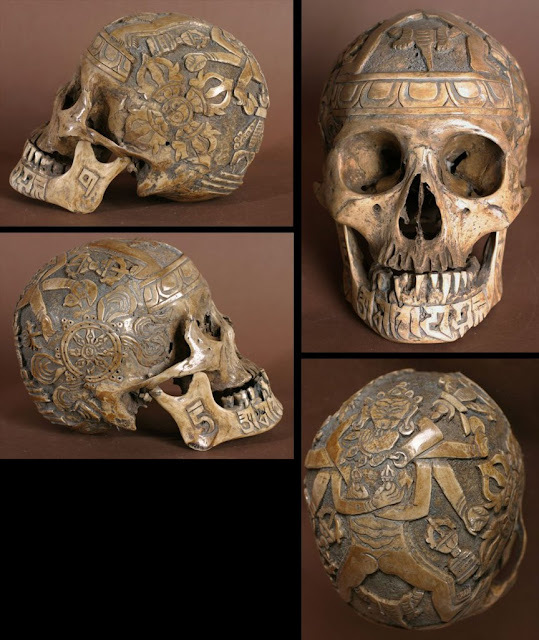 I also had a skull like that, and I corresponded with an exiled Tibetan monastery in Nepal and several Tibetan art dealers in order to ascertain its value as an object of cultural patrimony and potential return to its country of origin. Mine was very finely carved and appeared to be very old and I wanted to make sure that it hadn't been looted from a monastery. I have come to be certain that these skulls were carved in China for the tourist trade until China ceased export of human remains. At the time, they were available on eBay (where I bought mine). And although finely carved with accurate Tantric iconography, the text is largely gibberish (according to the monk with whom I corresponded). Eventually, I spoke to a collector who had several of these, and he showed me the Chinese Website where you could order them and select the imagery and the patina (they all have the uniform "brown" of shoe polish or wood stain). Although Tibetan Buddhist rituals utilize skull Kapalas, authentic ones look nothing like these. In effect, these are like fake vampires: copies of things that never existed in the first place. In that, they are in and of themselves. They are beautiful works of art, but they should be sold with full acknowledgement of the fact that they are only 20-30 years old and made in China.